The Royal Navy's new aircraft carrier has left its home port for the first time. HMS Queen Elizabeth - one of two new carriers being built at Rosyth dockyard in Fife at a cost of more than £6bn - is to begin sea trials. The ship passed under the Forth Bridge just before midnight. 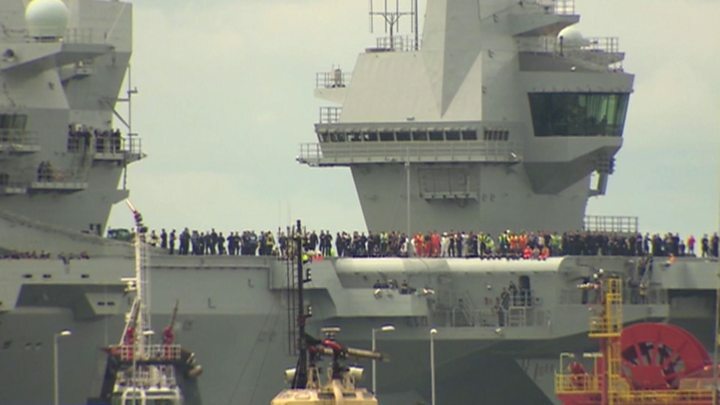 It is the largest warship ever built for the Royal Navy. The flight deck alone is the size of three football pitches. Once in service the ship can operate with a crew of 1,000 and 40 aircraft. The 65,000 tonne warship is the Royal Navy's first aircraft carrier since HMS Illustrious was scrapped in 2014. Eleven tugs manoeuvered it out of the dock at Rosyth. It then squeezed through the narrow entrance into the Forth estuary. Once low tide is reached at about 23:00, the warship will have to lower a mast to make it under the Forth bridges - with just a few metres to spare. Commanding officer Captain Jerry Kydd said the ship was important for Britain's reputation as a naval power. "I think there are very few capabilities, by any country, that are as symbolic as a carrier strike capability," he added. "Submarines you can't see, but these are very visible symbols of power and power projection." Defence Secretary Sir Michael Fallon said: "This is a historic moment for the UK as our new aircraft carrier takes to sea for the very first time. "This floating fortress is by far the most powerful ship ever built in Britain that will enable us to tackle multiple and changing threats across the globe. "HMS Queen Elizabeth is an enduring example of British imagination, ingenuity, invention that will help keep us safe for decades to come. She is built by the best, crewed by the best and will deliver for Britain. "For the next 50 years she will deploy around the world, demonstrating British power and our commitment to confronting the emerging challenges from a dangerous world. The whole country can be proud of this national achievement. " The start of sea trials follows warnings that technical issues and personnel shortages could delay the deployment of the aircraft carrier. The National Audit Office said in March the project was entering a "critical phase", with many risks to manage. The Ministry of Defence acknowledged "challenges" but said it was committed to being fully operational by 2026. The technical issues mean the forthcoming sea trials are three months behind schedule. The NAO predicted it would not be operational by 2020, as had been promised by the MoD. 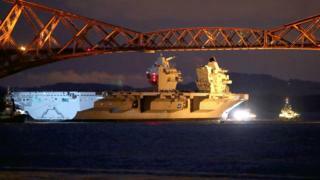 The BBC's defence correspondent Jonathan Beale said that if all went according to plan with the latest developments, HMS Queen Elizabeth would be sailing toward open waters on Monday evening. He said the Royal Navy expected Russia's military to take an interest while the warship was being tested in the North Sea. It will be several years before HMS Queen Elizabeth is fully operational with jets on board.